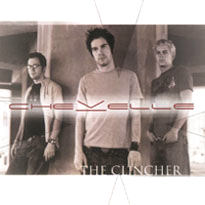 "The Clincher" is the second single from Chevelle's third album This Type of Thinking (Could Do Us In). The song is about claustrophobia, as confirmed by Sam Loeffler. Despite this, many people still mistakenly infer that the song is the band's take on The Passion of Christ, due to lyrics like "helped to nail down" which refers to the crucifixion. The song appears on the soundtrack to the video games Madden NFL 2005 and Guitar Hero Live. ^ James Montgomery (2005-02-01). "Chevelle Get Poles Shoved Through Their Chests For 'Clincher'". It's about claustrophobia. It's cool to get a song out on the radio that everyone can listen to but it's about such a dark subject. ^ "Madden NFL 2005: Soundtrack Revealed - Xbox". News.teamxbox.com. 2004-07-01. Archived from the original on 2012-03-04. Retrieved 2012-08-17.